Our last visitors from Malta brought some of my favourite sausages along, coarse Maltese pork sausage stuffed with lots of spices and garlic. The kind that you can use to spice up a whole pot of soup. When it comes to sausage that’s exactly what I like! When I’m in Malta I fry them for breakfast without their skin and cut in half, like a burger, some fried zucchini (qarabaghli in Maltese) on the side and and I’m prepared for a day on the beach. 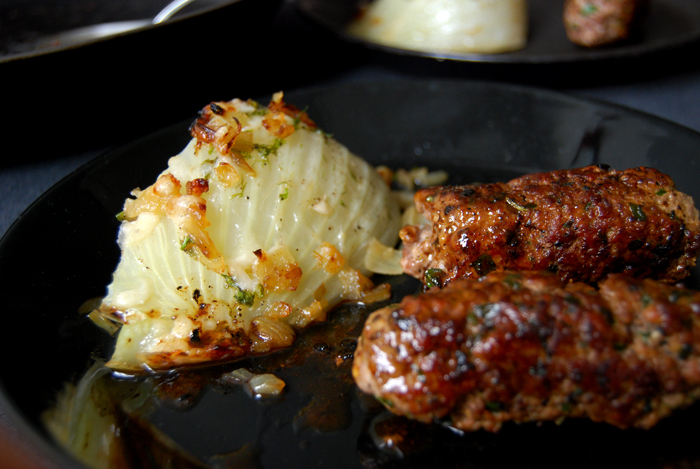 The gift from Malta inspired me to make my own sausages, but without skin from the start. I make mine like burgers without egg and bread (apart from a tablespoon of breadcrumbs) and with pork and beef unlike the original. Most importantly they are enhanced with plenty of rosemary, parsley, coriander and fennel seeds (luckily I still have some left from Malta to keep it even more authentic) and my coarse sea salt from Mr. Cini’s salt pans in Gozo, Malta’s sister island. Spices and salt from other parts of the world will work as well, I just like to add the nice memories and to me, they taste best. 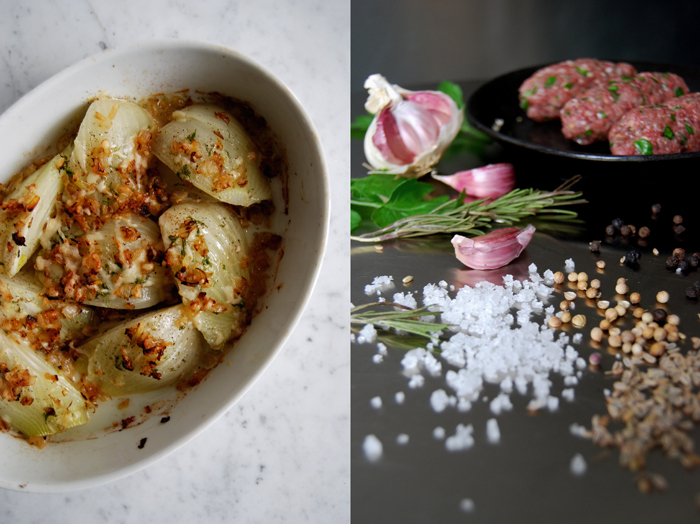 As fennel already has such an importance in this meal I add the bulbs as well, baked in the oven with onions, garlic and parmesan. It’s the right addition to my Mediterranean sausages which I fry first before I deglaze them with a splash of white wine. This makes a thick sauce of juices, delicious together with the meat and the vegetable. This makes a dinner for 3-4. Mix the ingredients well and shape thick sausages. Heat some olive oil in a large cast iron (or heavy) pan and fry the sausages on medium heat until all sides are golden brown. Deglaze the sausages with a splash of wine so that the bottom of your pan is covered, the liquid shouldn’t evaporate completely. Turn down the heat, scrape the juices off and close the pan with a lid for 1-2 minutes until the sausages are done inside. Set the oven to 200°C / 390°F (I used the Rotitherm roasting setting) and brush a medium sized baking dish with olive oil. Fry the onion and garlic in a little oil on medium heat until golden brown. 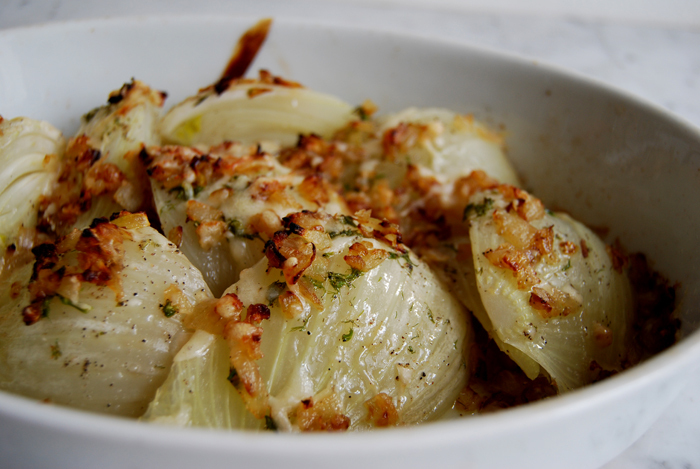 Put the fennel in the baking dish and sprinkle with olive oil and the green of the fennel. Season with salt and pepper, add the fried onions and garlic and cover with parmesan. Bake for 10 minutes until the cheese is golden brown and crisp. 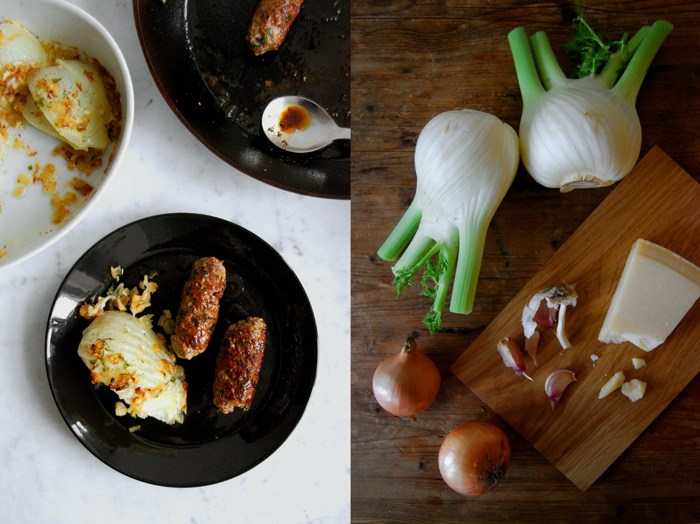 the way you make your own sausages… yes, please. 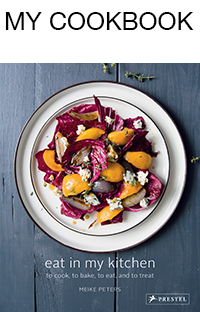 the baked fennel… just, WOW. how you deglaze the sausages with white wine… love. fan girl moment. These look completely delicious. As i learn more cooking i am learning that home cooked almost always means better. As sausage is one of my favorite foods i think its time to get to some sausage making. Thanks Charlotte! I’m happy your like it! 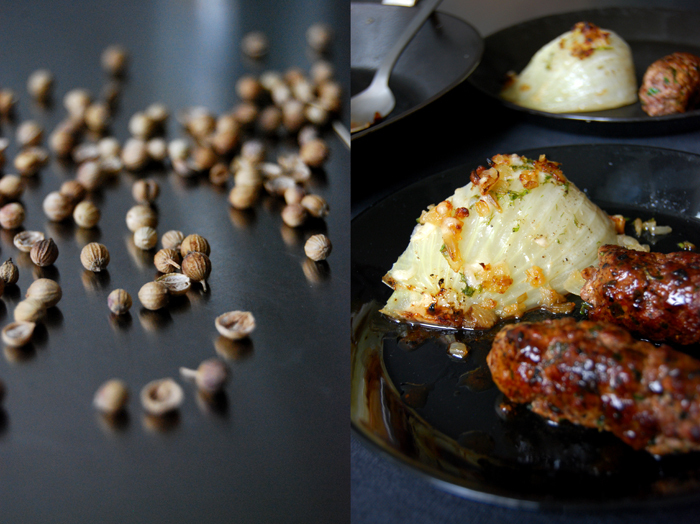 I understand your family, I prefer them homemade too 🙂 I like sausages stuffed with spices, herbs and garlic, like the ones we eat in Malta in summer. I hope you (and your family) will enjoy them!